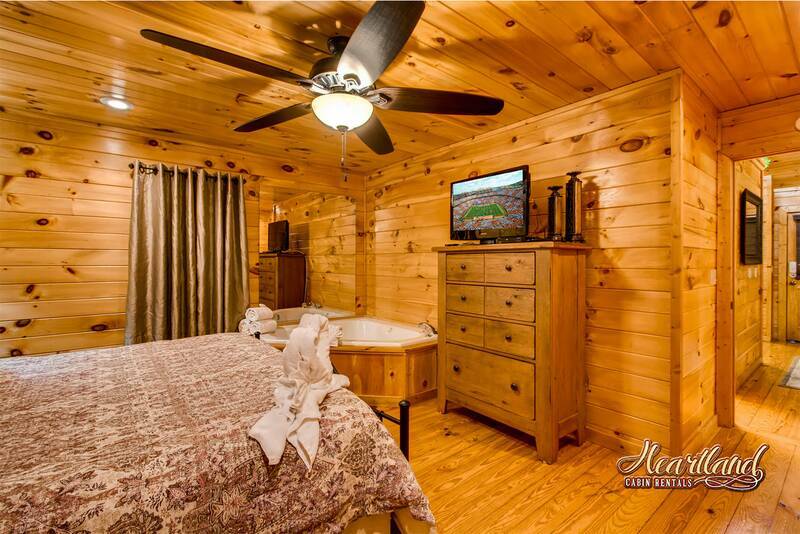 Cuddlers Paradise Cabin is just the place for a loving couple looking for a romantic cabin. 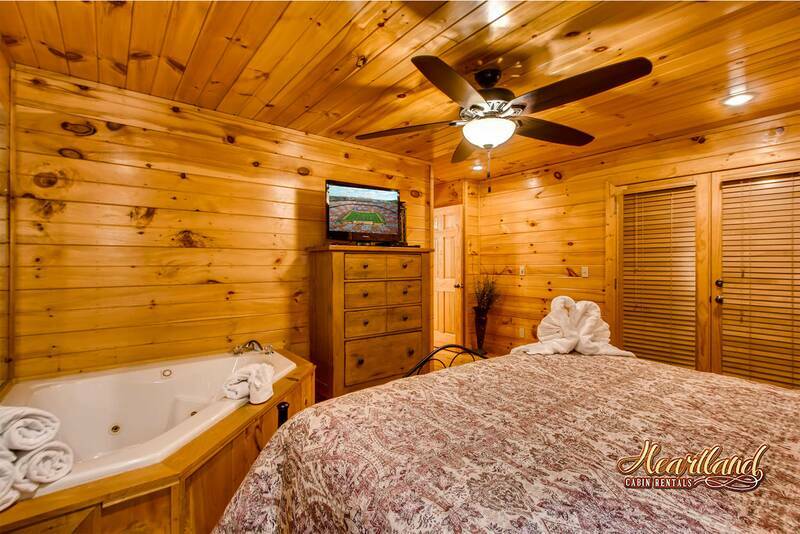 The master suite offers you a nice king size bed with a jacuzzi tub to enjoy a nice, long bubble bath. 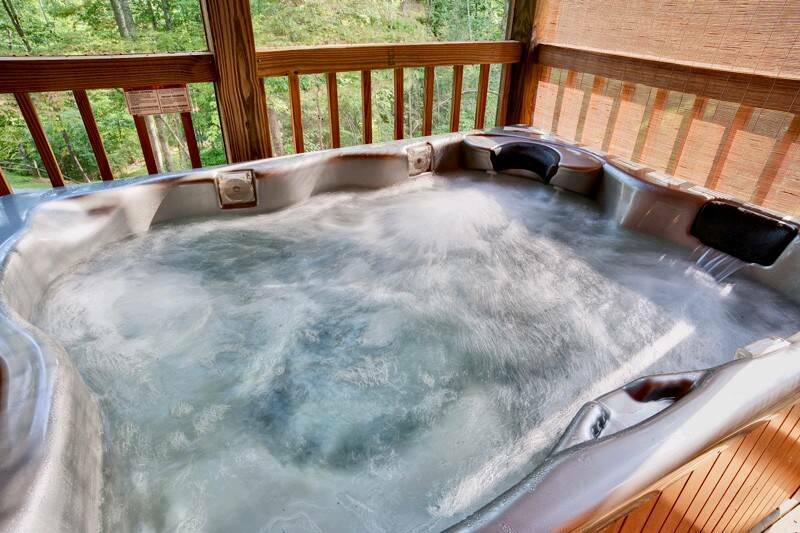 You can walk from the bedroom right out into the hot tub where you can relax and enjoy a evening of love and laughter. Cozy up to the warm gas fireplace on a cold winter night or lounge in the refreshing hot tub overlooking the wooded mountains, come and cuddle in this wooded paradise while enjoying a fresh cup of coffee made with the Keurig coffee maker. 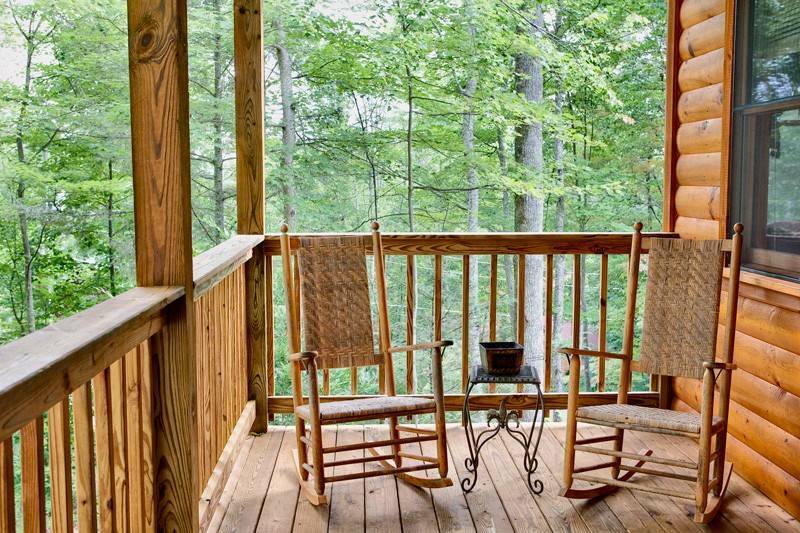 The front porch is provided with rockers for your enjoyment. Wild life viewing all year around and in the spring and summer months while rocking on the front porch you can enjoy the flowers and nature. 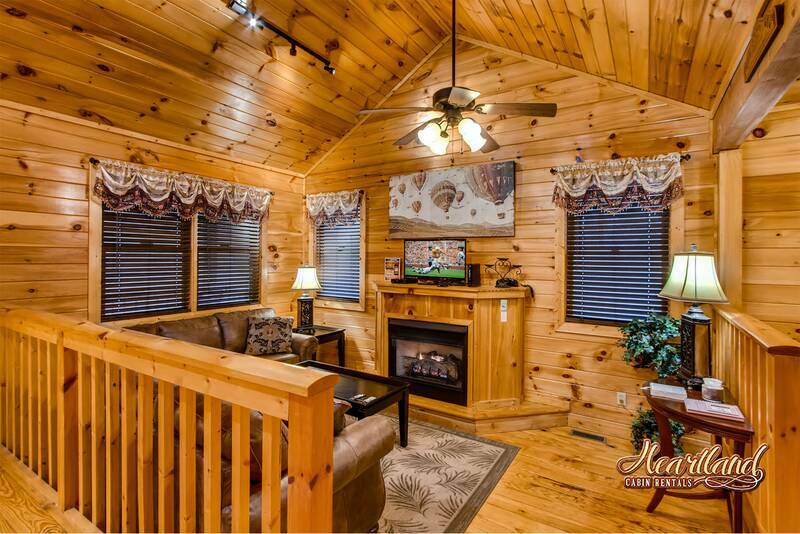 This cabin offers local, sports and over 100 channels as well as High Speed Internet Service and FREE local and long distance calling! 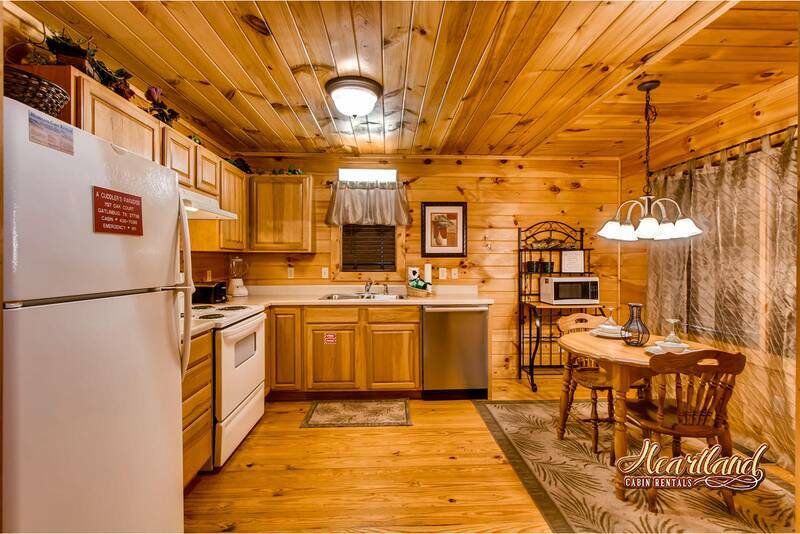 Cuddler's Paradise was the perfect cabin for two. First, I have to say that it was by far the cleanest cabin I have ever stayed in. The cozy couch and fireplace were perfect for relaxing in the evenings. The hot tub was clean and a must have after a fun day of exploring. 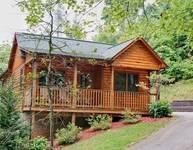 I would recommend Heartland Cabin Rentals to anyone looking for the perfect vacation getaway. The cabin is well situated for those who want to feel like they are “getting away from the world” but still want access to area attractions. Well equipped (although a couple of blankets or throws in the living area would have been nice). Our cabin was perfect. It was a great escape. Clean, peaceful, and still close enough to activities in Pigeon Forge and Gatlinburg. We hope to come back! 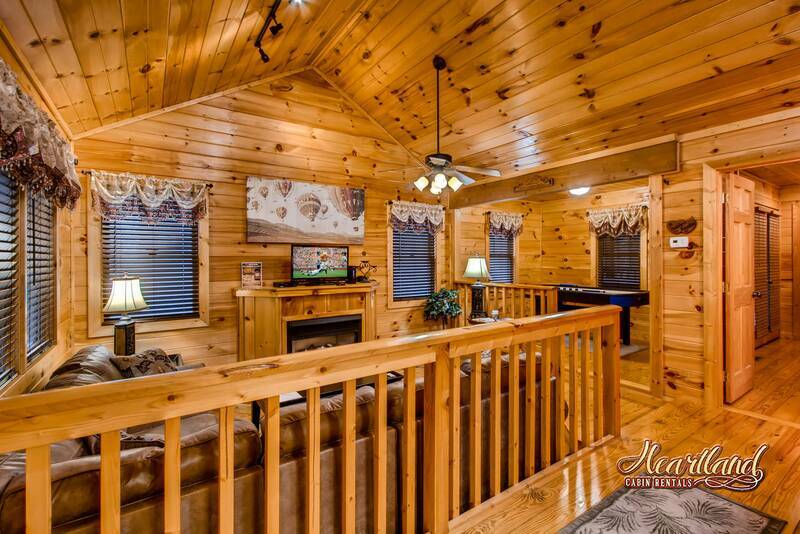 The cabin is beautiful and kept clean. We had a great week. We had an awesome time !!! When we arrived check in was very quick the lady at the front desk, was very nice and helpful. 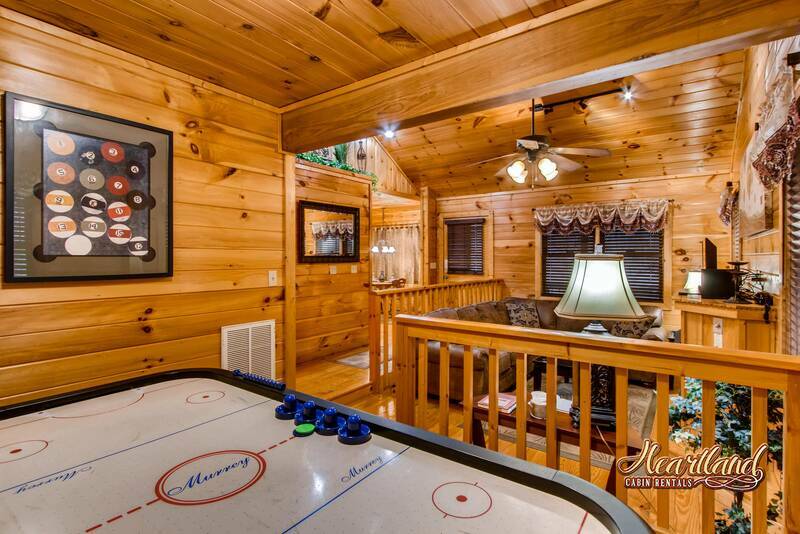 The cabin was clean and very nice my husband & I enjoyed playing ice hockey. As well the jacuzzi tub and sitting outside in the rocking chairs, enjoying the weather. The only problem was the pot holes in the road, but we will be back again. I loved this trip! The cabin was a pleasant surprise. Pictures don’t do it justice. Such a quaint setup. *Be prepared for a steep incline on the driveway, but you’ll make it :-). It became fun in-and-of itself. Four-wheel drive is highly recommended on adverse pavement :-). In the winter months. The cabin was beautiful! It was very clean. Peaceful and quiet! Nice Cabin, Nice price, Nice package. Overall great experience, I will definitely return in the future and will book with heartland. Hot water heater a little to hot. Road could use some work. Loved being up in the mountains where we could come back and get away from the hustle and bustle. It was easy to get to which i was worried about since we would be on back roads. We definitely enjoyed our stay. The only down side was the DVD player would only work for like 20 minutes then freeze. 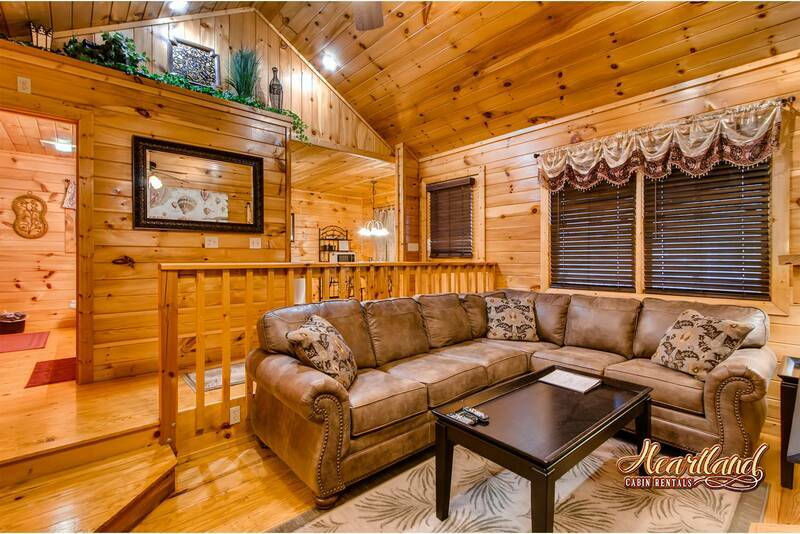 Cuddler's Paradise is an amazing cabin! Check-in was a breeze. We were given directions to the cabin, places of interest, and all info for the cabin. It was very clean and neat. I loved the interior decorating. It was beautiful. My husband and I enjoyed the hot tub and the gas fireplace. 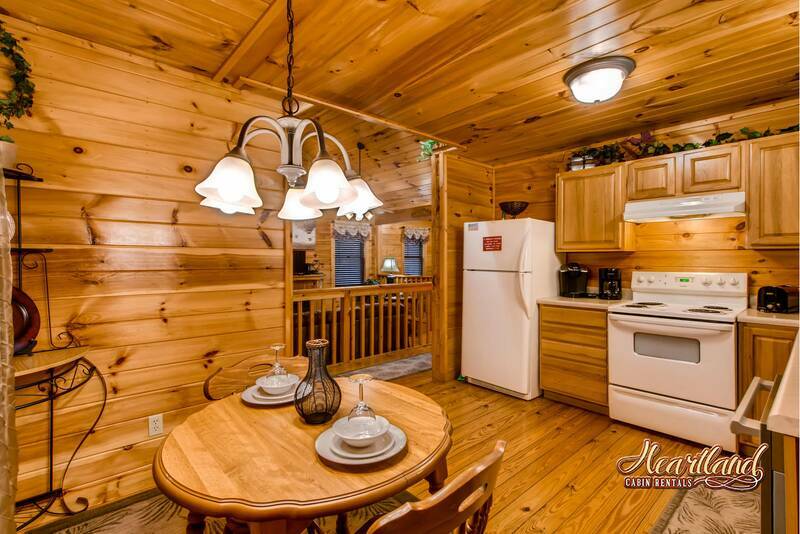 The cabin is between Pigeon Forge and Downtown Gatlinburg. We didn't have any problems driving to either place. Overall, it was a Great trip! I really enjoyed our stay! The cabin was in a great location and perfectly secluded. The size was ideal for two and I would definitely stay here again! Loved this remote cabin! Very relaxing. The cabin was perfect! We enjoyed the privacy being at the end of a dead end road. Well worth the trip! Nice cabin! enjoyed our stay.the drive was ruff especially for a little car and the neighbor's was a little loud then we cared for.but all in all a nice weekend getaway for anyone! This is probably the 4th cabin we have stayed in through Heartland Rentals. A Cuddler's Paradise was cozy, quiet, and relaxing. The hot tub and Jacuzzi tub were a great way to end the days from hiking and walking. The Keurig coffee maker was a bonus! The staff are always amazing and so helpful and that's why we never waste our time looking at other rental companies when we are looking for our next cabin. We hope to be back in the fall. Thank you so much for another awesome stay!! Beautiful and relaxing cabin, we were very happy with it. The cabin was perfect for our stay. It was clean and beautiful. Though we were gone most of the day, it was nice to go back and relax at it. We had been deciding between this cabin and a hotel and this was definitely the way to go. It was pretty close to all of the tourist activities in Gatlinburg and pigeon forge as we'll. We absolutely loved staying with Heartland Rentals! Everyone we spoke with and had contact with was extremely friendly and helpful. The cabin itself was perfect for us, we loved the location and all aspects of it. 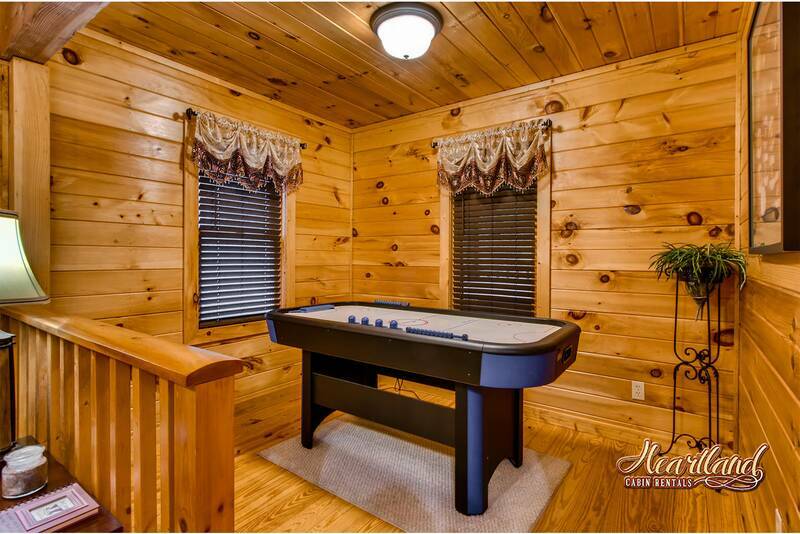 We loved the air hockey table and got daily use out of the hot tub. The kitchen was stocked with everything we needed. The staff are always very friendly and we appreciate them welcoming us. We stayed in Cuddlers Paradise for our honeymoon, and we both feel we couldn't have picked a better location! We arrived late on a Sunday, and Heartland Rentals was proactive in communication with us about late-arrival instructions (very easy). The cabin was spotless and perfectly prepped when we arrived. We also had a blast exploring Gatlinburg, Pigeon Forge, the National Park, and much more. We will definitely be returning the next time we can! Thank you for an awesome experience. Loved our cabin & enjoyed our weekend getaway, which we needed badly!! We fully enjoyed our stay at Cuddler's Paradise. Heartland Rentals is definitely the agency we will use in the future! Also, the Gateway to Fun pass was kind and it saves you money every night of your stay! You scan the pages looking for that perfect "Place" to match your dates and your wallet....Cuddler's Paradise was that "Perfect" place for my Wife & I. Perfect size, Perfect Amenities, Perfect time of Year & Perfect View. First impressions upon walking into what we dubbed "Cuddle Cabin": The kitchen is huge and includes a blender, two coffee makers (one regular, one K cup), pots, pans, silverware (lacking in the knife dept. and no scissors though), and a standard refrigerator, microwave, stove and oven. The living room is cuddle central! We loved the gas fire place, vaulted wood ceilings and comfortable couch. The bathroom was clean with a lovely little shower for two we could sit down in and towels were included! The bedroom was huge and we loved the king size bed! The fabulous jacuzzi tub was perfect for daily bubble baths. 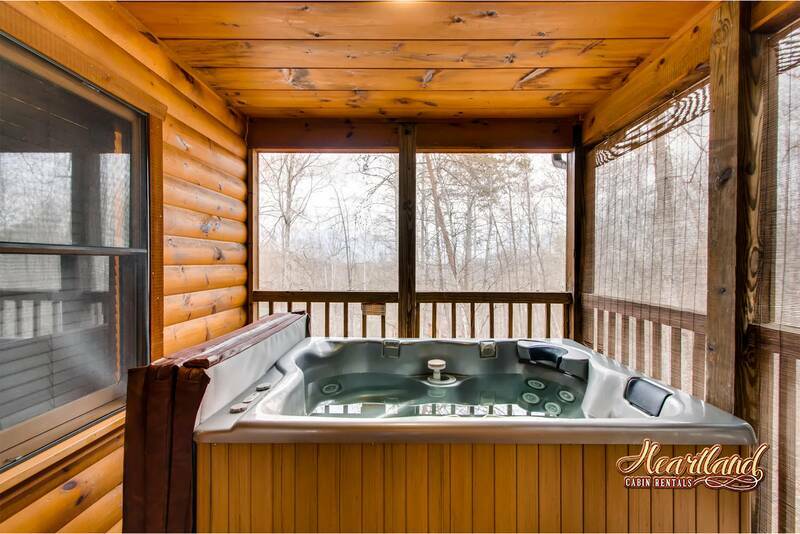 I think one of our favorite amenities was the hot tub outside of the bedroom in it's own secluded closed in porch. We didn't use the "game room" . We were too busy cuddling anyway. We urge Heartland Cabin Rentals to maybe change the name to "Cuddle Cabin" because we like the alliteration and it's more fun to say. lol. 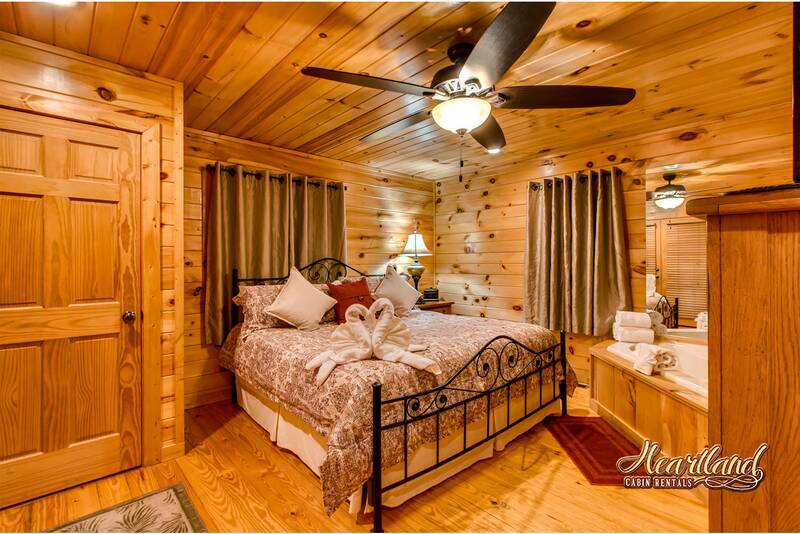 Great cabin with an excellent location..
relaxing, romantic, and the perfect little cabin for a couples getaway! We loved the cabin! It was in the perfect location - secluded in the woods yet still close to town. It was the perfect spot for some r&r ans quality time together. We can not wait to come back. This cabin/ cuddlers paradise and cabin rental was absolutely amazing. We were literally in the woods so we had no view but it was extremely clean and nice. perfect location wasn't too far or too close from the city. One of our greatest 1 night stays. We love to stay extra few more day! It is beautiful place. Saw a bear, right outside the cabin it was wonderful. This place was amazing. It was away from all the hustle and bussell. We will be staying here again. We had the most amazing time in Gatlinburg and waking up every morning in this cozy cabin made the experience all the more exciting. The cabin really had that mountain vibe that we were looking for. We loved sitting on the porch and enjoying the view. It was the perfect little getaway for us. The serenity of the cabin was excellent, as always. We try to come twice a year and have for the past ten years. I do recommend replacing the hot tub cover as it is way past due. Love the new white bath towels. They are great. Thank you. This cabin was gorgeous and was a great place to get away from everythig and just focus on each other! We would highly recommend this cabin to any couple that's looking to celebrate anything from a honeymoon (like us) to a retirement or just to take a break and relax. We had an amazing time and we can't wait to come back! From check in to check out, staff was very friendly and helpful. Cabin was exceptionally clean and beautiful. Everything we could have imagined! LOVED LOVED LOVED the cabin!! The rooms, hot tub, Jacuzzi ... and thanks for decorating the Christmas tree! We loved the Heartland Rentals and had a pleasant stay for our honeymoon!. A refreshing stay that brought the Christmas spirit back to our busy lives! We loved every minute of our stay at Cuddlers Paradise. The quaint little cabin was perfect for us to slow down and enjoy the simple pleasures in life! When we weren't exploring the wonders of Tennessee, we just spent time reconnecting and enjoying the beautiful scenery. Thanks for making our stay so magical! The cabin was perfect! Very clean, nicely decorated, well equipped, great location! Could not have asked for anything better! Cabin was very nice and clean. Had a problem with the Jacuzzi but called and someone was there the next day and the problem was fixed. This was our second time staying in a Heartland rental and we look forward to coming back next year!!! The cabin was lovely and the rental came with one free admission to a couple of attractions that we visited. Would highly recommend this cabin! This cabin was very nice and peaceful. Very nice place to go to. The area as well was very nice with tons of activities to do. We have been using Heartland Rentals for years. We love staying in their cabins. They are so friendly and courteous. We love Cuddlers Paradise. This is the second time we have stayed here. Wonderful cabin for couples. Enjoyed our 4 night stay. cabin was private and secluded, but close to attractions. clean and comfortable. kitchen was well stocked with cookware. We enjoyed discount coupons for the aquarium, rafting, and zip-lines. the hot tub was perfect way to end each day. The location was perfect, the accommodations were great. We really enjoyed out stay. We always feel right at home when we come to Cuddlers Paradise. 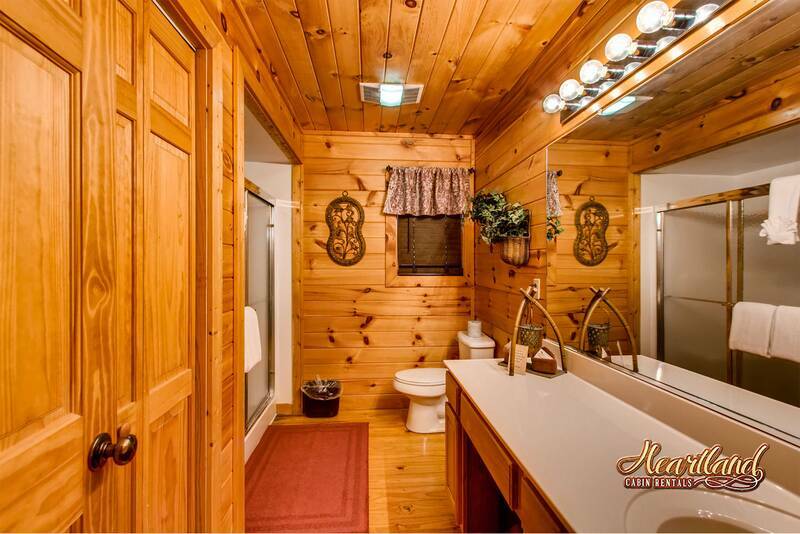 The cabin is clean and welcoming and we enjoy the privacy. Wonderful getaway for our honeymoon! 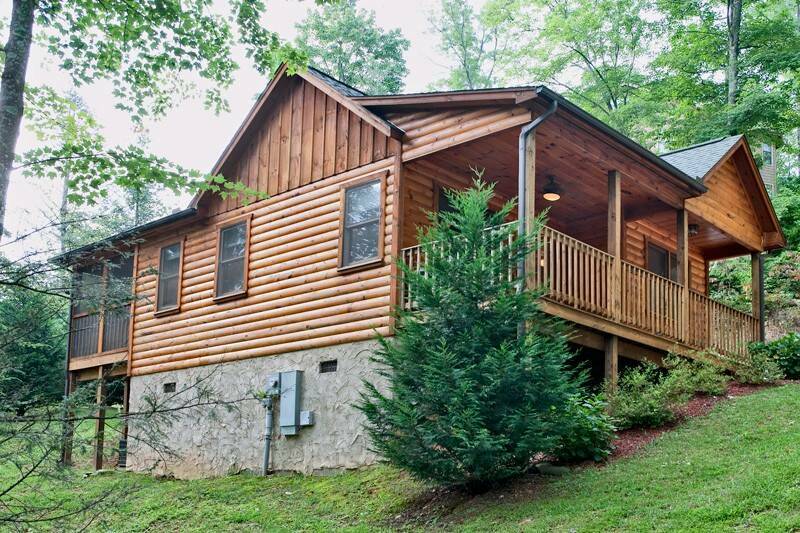 Loved this cabin- cuddled up in the mountains ( a nice little drive up)! Clean and well kept- we hope to come back soon! The girl I spoke with on the phone from Heartland Rentals, Gatlinburg office was always so very friendly! Loved cuddlers paradise. It was so cozy and relaxing. The hot tub was amazing and the air hockey was a plus. Was hoping to see a bear but we did not. Loved our stay in the cabin! It was a nice time for me and my wife for our honeymoon! 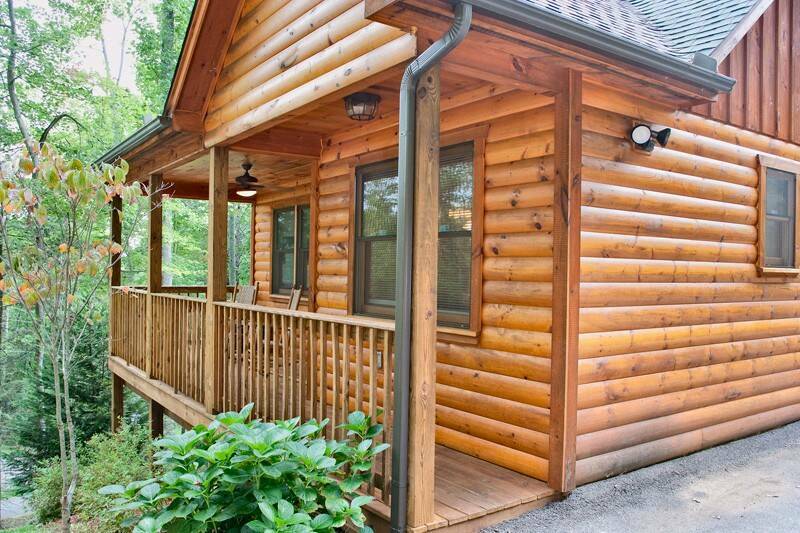 We will be back again and will rent another cabin with Heartland Rentals! Best time ever in the Smokies!!! We were greeted by Ms. Holly who gave us very clear instructions to our cabin. Our cabin was delightful and very peaceful. Thanks for a wonderful vacation!